Sharon Dube and Jeremiah Paris of Leadville won $3,222 At the South Park Ice Masters fishing tournament at Eleven Mile State Park and produced by the 11 Mile Marina on Feb. 11. The South Park Ice Masters is the second of three events in the Sports Column Colorado Classic Ice Fishing Tournament 2012. 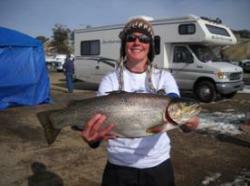 The Colorado Classic pays out more money than any other ice fishing tournament in Colorado. In the contest, teams consisting of two anglers fish for trout only. The 2012 event had an increase in teams participating, from 92 in 2011 to 111 this year. The first place is awarded to the team with the heaviest weight for two fish. There is also an optional part of the contest known as the Big Fish Pot which costs $20 per team with a 100% pay out to the heaviest fish of the day for qualified teams. This year's Big Fish Pot was $1,660.00 and was awarded to Dube and Paris who caught a with a 7.99-pound cutbow. The Dube/Paris team also took first place with a total weight of 11.18 pounds for an additional payout of $1,262.00. A sponsor, Eagle Claw also provided an additional $300.00 shopping spree at the Eagle Claw factory outlet store if a team purchased at least $5.00 in Eagle Claw products on the day of the contest and came in first. Team Dube/Paris did make the purchase and ended up with a day's total winnings of $3,222.00. Second place paid a whopping $1,010.00 and went to Taylor Depue and Daniel Montoya of Salida with a total weight of 9.73 pounds. Third place paid $808.00, which went to Pete Turner and Jim Douglas of Colorado Springs. Full contest results as well as details for the Marina March Madness final event, to be held on March 10, 2012, can be found at www.11milesports.com. The final event is unique with all teams required to fish in a designated area and features three individual 2-hour fishing sets with cash prizes paid for the first fish, and the first, second and third places by weight. In addition, there is a basketball court set up on the ice where teams can make 3-point and free throw shots for cash and prizes. Colorado Parks and Wildlife gets everyone outdoors! Attracting more than 12 million visitors per year, Colorado's 42 State Parks are a vital cornerstone of Colorado's economy and quality of life. Colorado State Parks encompass 224,447 land and water acres, offering some of the best outdoor recreation destinations in the state. Colorado Parks and Wildlife is a leader in providing opportunities for outdoor recreation, protecting the state's favorite landscapes, teaching generations about nature and partnering with communities. Colorado State Parks also manage more than 4,300 campsites, and 63 cabins and yurts. For more information on Colorado State Parks or to purchase an annual pass online, visit www.parks.state.co.us.